Veja as principais atrações da Cidade Eterna com este eficiente passeio a pé de 3 horas por Roma. Caminhe por praças e ruas para ver monumentos como o Panteão, a Fonte de Trevi e a Igreja de São Luís dos Franceses. 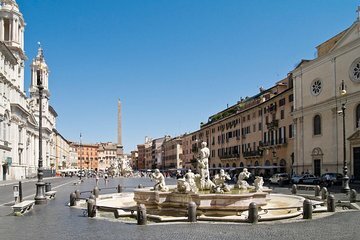 Veja as principais atracções como a Piazza Navona, o Panteão, a Fonte de Trevi e a Escadaria Espanhola. Our tour guide Lia did not seem very interested in giving the tour. She started the tour by saying if we walk fast then we can finish the tour early, which gave the impression that she wanted it to be over with as soon as possible. She also kept reminding us that it is our responsibility, not hers, to make sure we are keeping up and not getting lost. But then we took unnecessary breaks that were boring. She did not keep my attention and I found the entire tour boring. I would have rather saved the money and have done a self-guided walking tour. I would not recommend this tour. Maybe it would have been better with a better tour guide, but I'm not sure. Three hours was much too long for this walking tour. I would recommend doing an evening tour when it is cooler or doing a short 1.5 hr tour in the morning. Or just do your own. Not worth the money for this one. We really didn't have a great time on this tour and we felt a little screwed over to be honest. We walked through a lot of great things and in some cases we stopped to get some Gelatto at 10 AM? and take pictures. But we just kind of brushed passed the Pantheon which I felt was a bit odd. We also stopped briefly at a pharmacy fro our guide to pick something up. I wasn't impressed and neither were the people I was with. We ended up going back to a lot of place we skipped over the next day. Anna from When in Rome was our tour guide. We saw all of the major sites except the colosseum and Vatican, which we had booked for another day. She was very nice with an abundance of knowledge and although it is a long tour, she allowed a bit of free time to toss a coin in the Trevi Fountain and also to walk around Camp de Fiori. I would highly recommend this tour to get yourself acquainted with the city. Great introduction to the wonders of a great city.